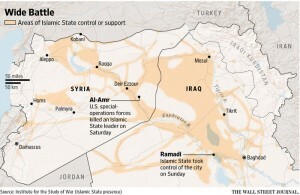 Takeover is a crushing setback to U.S.-backed efforts to halt the spread of the extremist group. Islamic State seized control of the capital of Iraq’s largest province, killing hundreds of government forces and dealing a crushing setback to U.S.-backed efforts to halt the spread of the extremist group. The fall of the western city of Ramadi, once home to nearly half a million people, represents Islamic State’s biggest military victory this year, gaining it another major Iraqi city among the territory it controls in Iraq as well as Syria. The advance, a day after a U.S. special-operations team in Syria killed Islamic State’s finance leader, has exposed the fragility of Iraqi forces, despite U.S. efforts to train them. Just as army units melted away in the Iraqi city of Mosul last summer, local police fled by the hundreds from Ramadi. In Washington, neither the situation in Anbar nor the developments in Syria were seen as likely to alter the timing or tempo of U.S. operations. Both the U.S. raid in Syria and the apparent fall of Ramadi reflect President Barack Obama’s attempts to minimize the chances of large-scale involvement by American forces, and are unlikely to lead to deeper U.S. action in either country. The defeat in Ramadi came as Iraqi government forces stepped up a campaign to push the militants out of Anbar province, the country’s Sunni heartland, before plans to move north and reclaim Mosul, Iraq’s second-largest city. “Ramadi, by military standards, has completely fallen to Daesh,” said Taha Abdul Ghani, a member of Anbar’s provincial council, using an Arabic acronym for Islamic State. Islamic State deployed truck bombs, suicide bombers, and hundreds of fighters called in from Syria to attack government buildings, police garrisons, and civilian homes, said Iraqi officials.